The Nigerian Union of Mine Workers (NUMW) came to limelight in January 2018 after two associations who operate in the same sector decided to put an end to their disputes. The two associations known as Association of Granite Supplier and Haulier (ASSOGRASH) and Independent entered into an agreement which brought about an amalgamation under Nigerian Labour Congress (NLC). 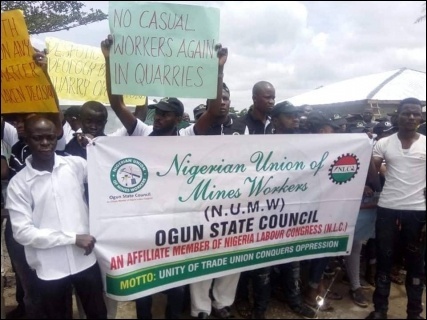 After the amalgamation of these two associations, the merged union was named NUMW since they have to do with operations relating to mining activities. Members of NUMW serves as an intermediary between Chinese investors (quarry owners) and consumers, i.e. the union members help in conveying granite products to the final consumers. They serve as quarry agents who pay into a quarry bank account, which enables their customers to load various sizes of granite. The constitution of NUMW makes it known that it is not only being an agent that qualifies you to be a member of NUMW. It is made known that quarry operators/workers who work in the quarries are also our members whose welfare becomes important to us. The leadership of NUMW has received all sorts of information about how the Chinese investors maltreat their workers who are our members. We have recorded cases whereby the Chinese investors would bully their workers, pay them peanuts after working several hours without break. 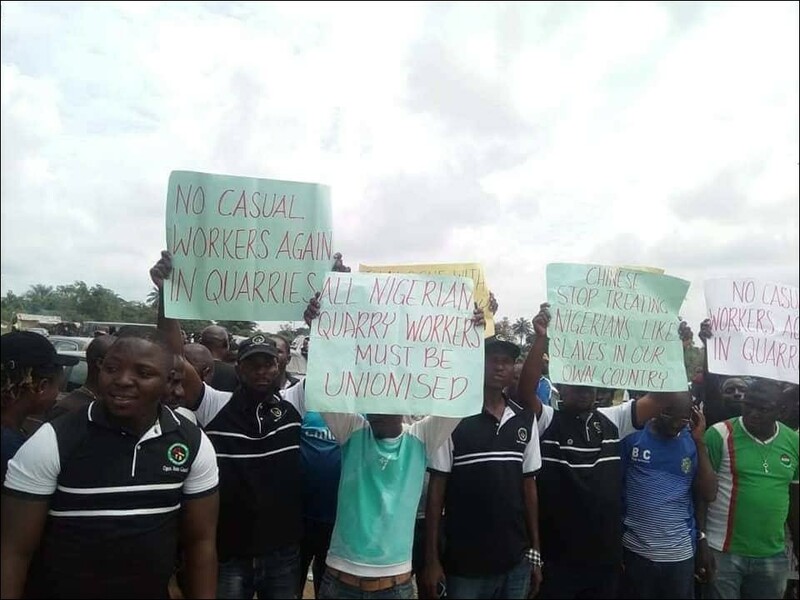 In line with global labour initiatives, the Decent Work Annual Celebration that was held on Monday, Oct 8, 2018 gave the leadership of the union an opportunity under the supervision of NLC to picket the quarries in order to save our members who are being treated as slaves. The picketing was led by Ogun State NLC chairman, Akeem Ambali, and some notable members of NLC. 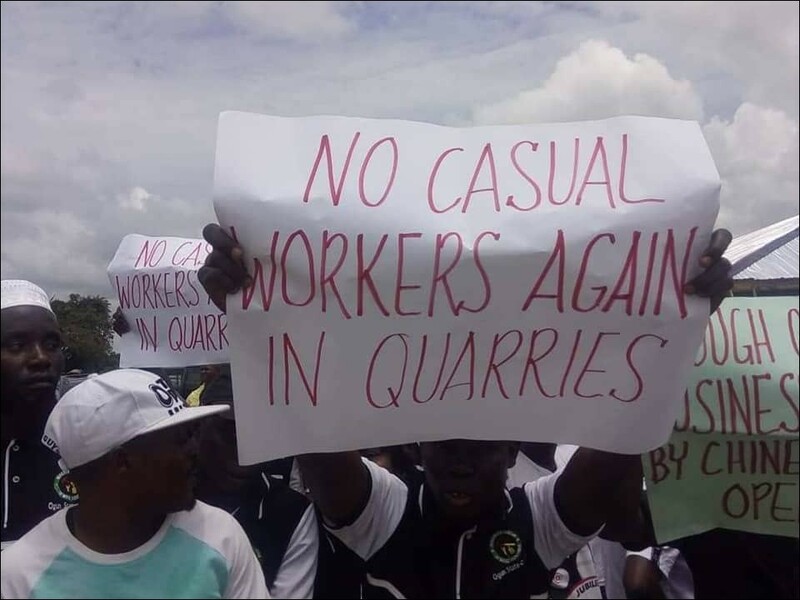 The quarries were stormed at around 11am by hundreds of NUMW members who came out enmasse to show solidarity to the campaign. Three (3) quarries that were picketed that day were A&B, Multiverse and Labstar quarries. The leadership observed different forms of abnormalities in the way quarry workers were treated ranging from unhealthy working conditions, child labour etc. 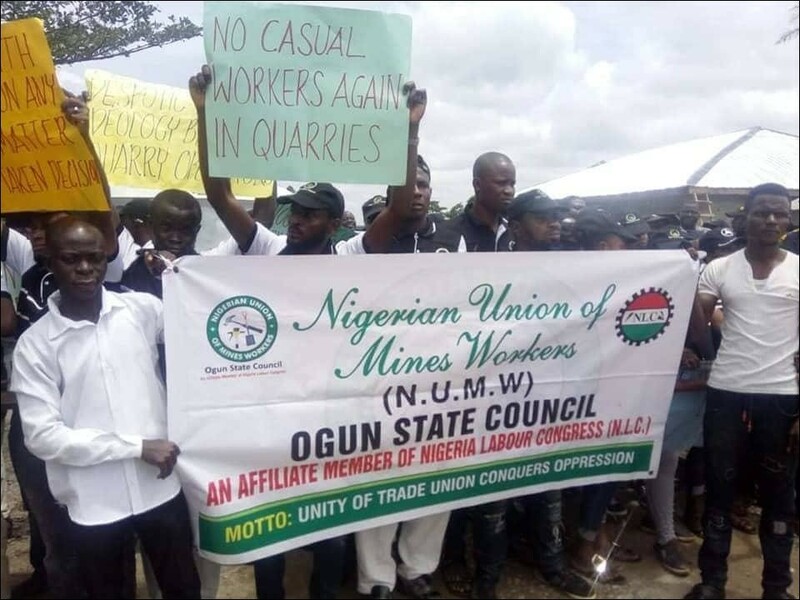 The leadership of NUMW under the supervision of Ogun State NLC pickets these quarries based on the following reasons; (1) Casualization of quarry workers, (2) Unionization of quarry workers, (3) Better pay and conducive working environment for quarry workers etc. The Chinese investors have been invited to several meetings with the leadership of NUMW by the Ministry of Commerce and Industry at Oke Mosan which they have refused to honour. It was as a result of this that makes the union take such step against the Chinese investors. After the exercise, the quarry workers were excited and were able to gladly write their names down to join the union.